Dark horses Brighouse Sports claimed their second Premier Division scalp of the season in the Halifax FA Albert Crabtree Saturday Cup at the weekend. They followed up their 4-3 win over Hebden Royd Red Star with a 3-2 success over Greetland to join Huddersfield Amateurs, Sowerby Bridge and Warley Rangers in the semi-finals. Sports, who were making it three away wins in this season’s competition after beating Salem in the first round, took the lead at Goldfields via Connor Durkin after 10 minutes. Greetland drew level with a deflected effort midway through the first half but Chris Allen restored Sports’ lead after 65 minutes with a good individual effort. Seventeen-year-old Josh Robinson is making a habit or coming on and scoring important goals and he made it 3-1 with an excellent effort. Brighouse came under the cosh in the last 10 minutes and conceded a second to another deflected effort but held on. Manager Garry West said: “We deserved it. It was a good team performance. “Our league position (sixth in Division One) does not reflect how well we have been playing. Huddersfield Amateur are arguably the competition favourites after putting out Halifax AFL title contenders Ryburn United 2-1. Jonny Crowther got both goals for the West Yorkshire League side at Ripponden Wood with Christian Silkstone the home scorer. Lee Wood hit a hat-trick as AFL Division One leaders Sowerby Bridge beat Premier Division derby rivals Sowerby United 3-1 at Ryburn School. The Bridge started strongly and their direct play had United defending deeply. It was no surprise when Wood put them ahead but United started to get more of a foothold in the game. 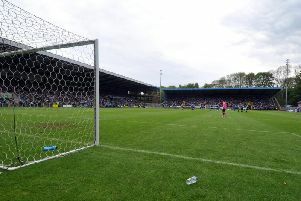 They missed a great chance just before the break and then a penalty in the first minute of the second half after Rory Thickett had been brought down. Wood raced clear to make it 2-0 midway through the half and lobbed a third against the run of play. Harvey Walsh replied late on. Unpredictable Warley Rangers beat Midgley United 2-1 at Shroggs Park, having lost 4-0 away to the same opponents in the Premier Division a fortnight earlier. Carlton Balmer’s penalty 10 minutes from time settled matters after Midgley had battled hard following the dismissal of Toby Standring shortly before half time. Rangers, with almost a full squad to pick from, went close through strike duo Mark Kelsey and Balmer while Midgley relied on their aerial advantage and long throws from Ryan Jefferies. Warley took the lead after 25 minutes. Some quality passing started by marauding full back Jonny Lamb resulted in Kelsey feigning a shot from the edge of the area, bursting into the box and calmly slide his shot under the keeper. Standring was dismissed for an off the ball incident - much to the disappointment of visiting boss Craig Gee - but Midgley’s 10 battled hard and drew level when Andrew Butterworth’s excellent free kick was headed home by Rob Stansfield. Rangers’ response was instant. Dan Kirman burst through from midfield and after some neat footwork was hacked down in the area, Balmer stepped up to put Warley ahead and they comfortably saw out the final 10 minutes.